I awoke early last Sunday morning, as I usually do, to go and check my moth traps. The evening before I had placed a couple of battery powered heath traps in a local woodland in hope of finding something new. The excitement started before I even made it to the wood though. Only a couple of miles from Ballycastle in the limited early morning light I spotted a small object in the middle of road. As I approached I slowed and the headlights of the car began illuminate the shape as a bird. A bird with all the colours and markings of a Turtle Dove! It didn't move, even as I drove alongside. Fearing it has been hit by another car on this small country road I stopped to check on it's health. To my surprise as I opened the car door it flew off. It's flight was strong and it appeared to be in good health. What a brilliant start to the day, sadly no photographs, but what a view! After letting a few local birders know by text, I proceeded on to the wood to empty the moth traps, record my sightings and take a few photographs. 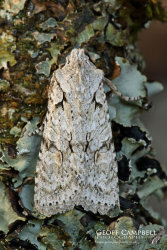 I was pleased to find a couple of Grey Shoulder-knot, quite a scarce moth in Ireland. 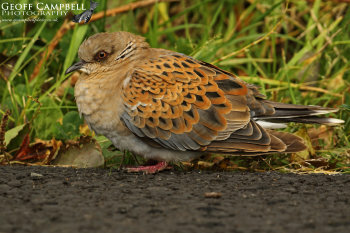 I decided to return by the same road just in case I could re-find the dove. To my amazement there it was, in the same place, this time at the side of the road. I stopped and watched it for a few minutes, but with the rain coming on and the road getting busier with traffic it once again flew off. I went home for a much needed breakfast and a change of lens for the camera in case bird want to stay around. About an hour later the rain had eased so I returned, but no bird. I parked up on the verge and waited a few moments. As the soon as the rain stopped the bird reappeared, walking up the sides of the road feeding on grass seeds. As I sat in the car the bird walked straight past me and I got a few images in the poor light. By this stage I was getting very concerned for its welfare, as the dove failed to move as cars passed within inches of it. I and a local resident, who I had informed of its presence, scattered some wild bird seed away from the road. Only when a runner came passed did the dove again fly off. I had done what I could so I again left. As early afternoon arrived the light had improved so I paid another visit, well it would have been rude not to since it was so close to home. Again I quickly found the bird close to the road and finally got a few decent image in the better light as it fed in the roadside verges. 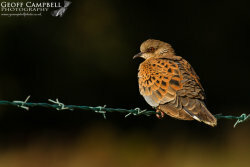 As a cyclist approached the bird flew up onto a fence and only then could I see it's true beauty in the afternoon sun. What a stunning bird, I almost forgot to raise the camera! 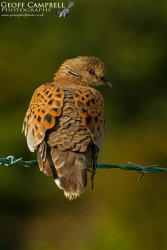 Turtle Doves are a summer migrant to Europe, spending the winter in the semi-arid region of Senegal, Guinea, Sudan and Ethiopia. 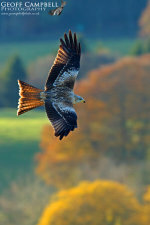 They have bred on a handful of occasions in Ireland, but can be more commonly found in southern and eastern England, though the population is crashing. They have suffered a 91% UK population decline since 1995 and a 78% decline across Europe since 1980. In the 1970's the British population was estimated to be 250,000 pairs. By 2015 it was thought there were less than 9,000 pairs with numbers halving every 5 to 6 years, so it could be lost from the UK within a few decades. Changes to agriculture, through intensification and increased use of pesticides, is believed to be a major cause and projects to provide food and nesting habitat have shown local successes.